blog.borud: The loss of a very special place? The loss of a very special place? I've been on quite a few trips to the Nürburgring and to me, the Ring is a very special place. Not only is it perhaps the most exciting race track I have ever visited (or driven on), but it is a historical site. All the greats have done battle on the Ring. You don't so much go on a trip there as go on a pilgrimage of sorts. In addition to the track, there's the people. The guys at Pinocchio, who always greet us when we visit and seem genuinely happy to see us again. There's Christa's where we always eat schnitzel on the evening when we arrive. Die Pistenklause where we stop by to lie and brag about our driving accomplishments and drink beer. Sonnenhof, where we usually have our briefings or dinner the night before we venture out on the track. There's Ron Simons' company RSR Nürburg, where we rent cars. And of course, there's Haus Marvin and Pension Diana where we usually stay. You know people by name, you stay at small places run by families, and you enjoy a personal level of service, and you come back year after year to the same places because it is good to see these people again. But of course, we would never be there if it wasn't for the Ring. It would appear that some people have recognized the pull of the Ring and that naive politicians have bought into the idea that the best way to benefit the tax payer is to commercialize the Ring in wichever way possible. To hand it over to private interests to package it and sell it. Well, I am to a large degree the demographic they want to attract, and I can only say that I do not like what I am seeing. What I have read over the past week about what is going on at the Nürburgring has made me wonder if I will ever go back again. Enjoying myself in various cosy establishments run by people from the area. I am not interested in staying at some large hotel. I am not interested in visiting shops. I am not interested in watching static exhibitions of dead objects when just outside the door there is one of the greatest racing tracks of all time. I am not interested in paying lots of money to be ferried around the track one or two laps. I am interested in what is genuine. I'm interested in experiencing the track. And there is only one way to experience it: you have to drive on it. If they want to turn the whole thing into a theme park: I'm sorry, but I'll just as well stay at home and not visit the Ring. Because watching what was a really nice place, with lots of nice people running small businesses being torn to pieces by greedy businesspeople who have absolutely no understanding of the cultural significance of the Ring, the people who live and work in the area and what it represents to people like me is just too painful. I'd rather not witness that. As an aside, just look at F1. I've visited F1 races. Perhaps my most exciting live F1 experience was at the Hungaroring. Not the greatest of race tracks and the facilities are...of a somewhat limited standard. But you know what? It was real! The wooden bleachers without any sort of roof may not have been the most comfortable, but the closeness to the track and the spirit of the people around us elevated the sense of genuine enthusiasm and fun. After the race I was wet, muddy and immensely pleased. We stayed a few days extra to walk around Budapest and spent our evenings in various restaurants. I often think about it and when I get the time: I'll return and hope to have much of the same experience. In comparison, I have been to one of the more modern tracks. Large, modern multi-billion dollar facilities designed to cater to ... I don't know who, but definitely not people like me. It sure as hell wasn't racing enthusiasts they were catering to. The whole experience was numb, dull, impersonal, and utterly uninteresting. It felt fake. I wasn't so much taking part in an event as just paying to be in the presence of lots of people who didn't even seem to be paying any attention to the race. I will never go back. I have zero cherished memories from that trip. None. If the german politicians want to extract the maximum possible value from the Ring, they must recognize that they can only do so by not screwing with the formula: the accessibility of the Ring is the key. Anything that limits access to the Ring makes it less interesting to prospective tourists. And if people do not come, nobody wins. Customers don't win, the people of the surrounding villages don't win, the german taxpayer definitively doesn't win and the whole region is worse off. Because we'll take our money and go elsewhere. As I mentioned before, I don't know if I will return to the Ring if what I used to come for is no longer there. I was going to visit the Ring this spring, but I will have to talk to some people to find out if we really want to. We've been talking about possibly taking a trip to Spa Francorchamps instead. After 7 years of faithfully visiting the Ring and leaving behind a ton of money at various local establishments, we are considering our options. Spa has a great race track, but I don't know the area well. Perhaps, if we find a nice place to stay and a company to rent track-prepared cars from, we will go there instead. But if we go there it will not be to prance about the place like a bunch of tourists. It will be to study the track, drive, and to drive as much as we can possibly afford. I hope that the Nordschleife is not lost. I hope that the politicians will take charge of the situation and not allow misguided commercial interests ruin the livelihood of so many locals and ruin a cherished travel destination for even more people all around the world. 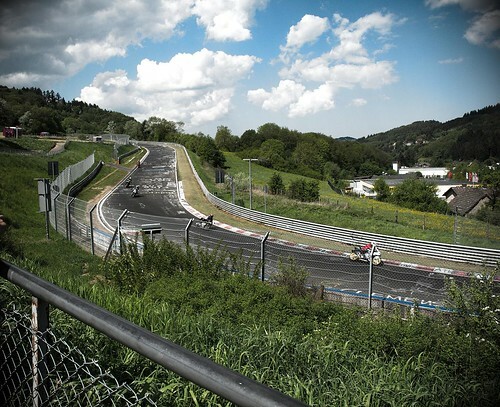 Do not forget why people come to the Nordschleife. Spot on. I've also posted a link to this on my forum if you don't mind.